I’ve watched this guy buy and sell some of the craziest properties you could dream of. And each time we’ve doubted him he has proven us wrong. On this episode Ruben Furtado shares how he started buying and selling real estate along with his son Austin Furtado. These guys are just fun to be around and know a ton about buying and selling high end real estate in the Greater Toronto Area. On this episode they share the lessons they’ve learned over the years, enjoy! Tom Karadza: Hey, everyone. It’s Tom Karadza, and on this episode, this is a really special one for me, we have Nick, he’s on the show obviously, and we have Ruben Furtado, and his son Austin Furtado, and if you don’t know Ruben’s story, he really started from nothing and then he went on to buy, and sell, and flip, and move into a bunch of them. 24 properties, his last flip was a home for 4.5 million, actually, his family lived in that home for a while, but it was for $4.5 million dollars, so you can imagine it was a two and a half year project. 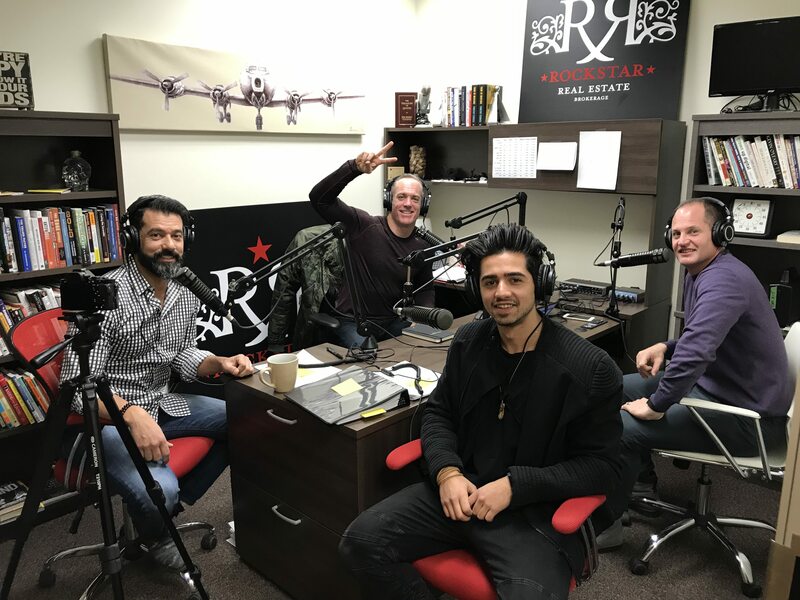 We have him on to share a lot of what he’s learned over the years, not only flipping properties, but we had a good time just talking about his life story, so wait to you hear where he comes from. There’s a story about a golf course that we kind of kick off with that I didn’t see that one coming. There’s a lot of lessons in it, and hopefully you pick up a lot of good stuff. It’s really a special episode for me, because after I left university, and I went into the IT industry, I left the Royal Bank’s IT department down on Front Street to work at Oracle Corporation out in Mississauga, learned a ton there, but I quickly learned in the tech support role that I was in that all the money was being made in sales. I specifically remember that after Nortel bought a bunch of Oracle database licenses, and I was stuck trying to teach these database administers how to set it all up while the sales guys were popping champagne, and partying. I realized I wanted to get over into sales, and I eventually did. I went in as a sales consultant for a few years, and then when I went into straight sales, Ruben Furtado was actually my first sales manager. Then we went off and flipped our real estate, but we were the only guys in the tech industry that were making money in the tech world, and taking the money we were earning, and not putting it into the stock market, but buying properties. Tom Karadza: Okay. We’re live. No more background music aloud. Tom Karadza: Talk into the mic, please speak into the mic like we practiced. Tom Karadza: Ruben Furtado is in the house with Nick, and myself, and his son Austin Furtado. We’re going to get all the intelligent answers from Austin Furtado, but Ruben good to have you here. Sorry, I enjoyed my own joke, there. Tom Karadza: That’s really unusual. Ruben, we got to begin, why did you at Erin Mills Town Centre, why did you take all the sand out of the mini putt course at Erin Mills Town Centre? Ruben Furtado: Probably because I didn’t know better. Basically, at that time, what I wanted to do was I wanted to, the most successful person around me then was actually the property manager, and I thought that was the only way I was going to make it to property management. Tom Karadza: Because what were you doing? Ruben Furtado: I just got promoted from being a security guard to basically managing the miniature golf course, and that was never profitable, so as soon as I took it over one of the ways to make it profitable was to cut back on costs, so instead of outsourcing all that work I waited until the mall closed, and with a bucket and a truck literally carried one bucket at a time out to a truck, removing all the sand to save the company $10,000.00. Tom Karadza: Nick, did you know this story? Nick Karadza: No. I didn’t know that story. Nick Karadza: You’re a worker, man. Tom Karadza: How many buckets off sand was that? Tom Karadza: How long did it take you? Ruben Furtado: You don’t remember that mini putt course there? Nick Karadza: I kind of do. Ruben Furtado: It was really nice. Nick Karadza: I’m younger than you guys, will not forget that. Tom Karadza: Yeah. We are old. Austin doesn’t even know what it was. Have you heard of the Erin Mills Town Center in Mississauga? Austin Furtado: I’ve heard this story. Ruben Furtado: Birthday party there for him, so he knows it really well. Austin Furtado: I’ve seen pictures. Ruben Furtado: Dumping sand back into it. Tom Karadza: You were not happy. Ruben Furtado: No. I wasn’t happy. Tom Karadza: But when you emptied all that sand, you were doing to try to get a raise, then did they give you the raise? Tom Karadza: How old were you? Ruben Furtado: I must have been 22. Tom Karadza: You had Austin? Ruben Furtado: I had Austin. Tom Karadza: When did you have Austin? Ruben Furtado: I think 22, 23 years old. Tom Karadza: You already had a son. Tom Karadza: Yeah. That’s crazy. Tom Karadza: Sounds like a management role. Ruben Furtado: No. The role was just to manage the golf course, and literally it was just staff, schedules, but it had nothing to do with what I was doing. All right? But either way they offered me 26,000, and I said, “No. The position is advertised at 35,” and they basically said, “Well, if you prove yourself.” All right? What we did, in less than six months, through things like that, me not outsourcing network, me doing a lot of the hours upfront, putting marketing programs together with other vendors, like other retailers, doing advertising on the back of the scorecards, we finally made that business profitable, and then I went in for my raise, and that’s when they said that unfortunately they didn’t have it in the budget, and I’m like that’s not possible. Tom Karadza: They didn’t give it to you? Tom Karadza: Wow. Yeah. Where did you go next? Ruben Furtado: I went out to the property managers car. Right? No I didn’t. Ruben Furtado: Yeah. I know. Ruben Furtado: Yeah. But it wasn’t their business. Ruben Furtado: They were just dealing with a budget, they took the budget for themselves. Tom Karadza: Yeah. I guess, that makes sense. Ruben Furtado: Maybe, again, they might have been seeing a little bit further a head, you guys know the golf course doesn’t exist, it’s gone. All right. Tom Karadza: Where was Austin living at that time? Where were you guys living? Ruben Furtado: At that time, yeah, we didn’t own a house. I think we were actually living in an apartment, because I remember I was supposed to be living in my dads basement. Right? Tom Karadza: This is in Toronto? Ruben Furtado: No, this was in Oakville. Tom Karadza: This was 1990-ish? Ruben Furtado: Yeah. Then ended up moving in with my mother-in-law, for just a couple of months, and eventually found an apartment. Ruben Furtado: And that’s where I think we were living at the time. Tom Karadza: Yeah. That’s crazy. When did you, so you left there, and then you started working where? Where was the next stop? Ruben Furtado: When I gave them that ultimatum, I didn’t have anything lined up, so quickly started making, because I figured they may not give me the raise, so I better find something, and there was a friend of mine that went to university, and he was working in a company, I guess I can mention the company, it’s Hummingbird Communications. Nick Karadza: Oh, you shouldn’t have said that. Tom Karadza: They hired you incorrectly dude. Tom Karadza: Are they even around anymore? Ruben Furtado: I don’t think so. Ruben Furtado: I think bought, yeah. Tom Karadza: Something like that. Tom Karadza: They had naming rights downtown, remember? Ruben Furtado: Yeah. They did. Tom Karadza: Called the Hummingbird Center. Ruben Furtado: Connectivity products. Either way, what ended up happening was, this guy Rick worked for them, university degree, and he was working at a help desk. Tom Karadza: He tricked them to get you in there? Ruben Furtado: No. What he did, he came up to me, he’s like, “Ruben, even though you don’t have the education, you’re probably a lot smarter than the people who are working there, and would work harder. I think I should get you an interview, so he got me an interview for a telesales role. This is like a telemarketing role where I’m literally just calling to book appointments for sales guys. All right? Ruben Furtado: I didn’t want to do it, because first of all it was an hour and a half drive, there was no 407, so I was driving in traffic from Oakville all the way to 404 in Finch. I didn’t know that industry, so I was really, really hoping that I was going to get that 2,000, because I was willing to take a lot less money, and do what I was doing than take that other job, it was offering 35, but with the commute and the uncertainty, but again I didn’t have that choice. I didn’t get the two grand, walked, and I took that job for 35,000. Tom Karadza: After that job, you went to Oracle? Tom Karadza: What’s pretty good money? Ruben Furtado: At that time about a 140,000. Ruben Furtado: Coming from, hey, I made them an ultimatum. Tom Karadza: How many times have we talked about the importance of our context? Ruben Furtado: Yeah. A 100%. Tom Karadza: Have you taught Austin that principle? Ruben Furtado: Oh, yeah. Absolutely. That’s why I expose him to you guys. Tom Karadza: Cool. Okay. After that, Oracle? Tom Karadza: Okay, stop for a second. Tom Karadza: I got to, furniture sales? Tom Karadza: Because you learned so much stuff, in furniture sales. Your dad ran a furniture store in Toronto, you used to ship the furniture, you ate McDonald’s in the store, a lot, I know, because you were the kind of knowing everything about McDonald’s even when I met you. Tom Karadza: But then you would deliver furniture, but the best part of all of that was, to me, and I know Austin must know these stories, is when you had to repossess the furniture. Tom Karadza: You told me that story of you and your brother, I don’t know how old you would be, do you remember? Ruben Furtado: I know I wasn’t driving. I was probably 14, my brother was 15. Right? Tom Karadza: Nick, have you heard this? Nick Karadza: I’ve heard parts of it. Tom Karadza: Something about a gas station. Tom Karadza: Okay. What happened? Tom Karadza: You and your brother? Tom Karadza: You guys are teenagers? Tom Karadza: What did the lady that was home do? Ruben Furtado: She was sitting there breast feeding. Tom Karadza: Oh, my God. Tom Karadza: You can’t make this stuff up. Ruben Furtado: Wait, it gets worse. Tom Karadza: From a mom with her child, while she’s breast feeding. Tom Karadza: Oh, dude, too much detail. Ruben Furtado: I know. I probably shouldn’t have said that. Tom Karadza: Detail. But, no, that’s fine. Ruben Furtado: But it puts you there. Right? As we’re taking the furniture apart, the legs, as we actually turn it over, dead cockroaches start falling out of the legs. Tom Karadza: This furniture was worthless? Tom Karadza: It was on principle. Ruben Furtado: We were going to burn the furniture. I didn’t care. Tom Karadza: You felt like they were stealing from your family. Ruben Furtado: A 100% they were. Tom Karadza: You were speaking or your uncle? Ruben Furtado: No. My uncle didn’t speak English. Nick Karadza: A 15 year kid had just emptied out this guy’s furniture. Nick Karadza: With an uncle who doesn’t speak english. Ruben Furtado: We held our ground. Tom Karadza: Was it a Portuguese brawl? Ruben Furtado: You know what? I guess they did not know how to react, because they were like, are they going to beat up these two kids? Tom Karadza: Where’s your uncle at this point? In the van? Ruben Furtado: Because he had his own issues. Tom Karadza: It was you and Manny? Tom Karadza: Wow. You held your own, which means you left with the furniture, and the money? No. Just the furniture. Ruben Furtado: He had paid maybe about 50% of the furniture, so we basically, actually we took the furniture back, cleaned it all up, and then resold it for the same price that was outstanding on it. Right? Ruben Furtado: It worked out. Tom Karadza: Huge impact on your life, that furniture store? Tom Karadza: I think we’ve all learned from our father on what not to do. Ruben Furtado: What’s Austin learning from me what not to do? I’m curious, now. Tom Karadza: There’s a long list, dude. Tom Karadza: We make a list for him, too. Austin, have you thought about these three things? Don’t do these three. Austin, see your dad right now? Yeah, don’t do that. Austin Furtado: Okay. Got it. Nick Karadza: The benefit is that they get to learn what not to do. Nick Karadza: And then you’re two steps behind, because you still have to figure out those same lessons. Nick Karadza: How many properties do you think you’ve bought and sold over the years? Bought, some were family homes that you moved into, others are straight up flips that you’ve done. Nick Karadza: It’s in the 20s. Nick Karadza: Is it over 30? Ruben Furtado: No. I don’t think it’s that much. Nick Karadza: Between 20 and 30 somewhere now. Ruben Furtado: I think so. I know we’re getting smarter. We’re basically buying the homes, and holding onto them, rather than trying to sell them, and then renting them out. Nick Karadza: Oh, that’s a funny, where did you get that idea from? Ruben Furtado: I don’t know, man. Nick Karadza: That’s something people do? Ruben Furtado: Yeah. That’s the one thing I wish I could change is holding onto more property. Tom Karadza: Across the street. You know? Okay. The first home you moved into that you would say that you bought and sold, which was kind of like a family flip, if you will, was it a mattamy, semi detached, or something? Ruben Furtado: Yeah. We ended up, I think it might have been a mattamy. Yeah. It was in Burlington. Ruben Furtado: It was kind of first exposure to actually being involved in purchasing a home for myself, but even at the age of 14, literally it was myself driving my dad out to a property, and I’m like, “We should buy this house,” at 14 years old. Right? But when I got married, the very first house we bought was a semi, I still remember, we bought it for a $135,000.00. Tom Karadza: Yeah. Can you imagine? Tom Karadza: And you were freaking out. Tom Karadza: Was that house. Austin Furtado: Yeah. Withering Heights. Tom Karadza: Yeah. That was the most beautiful townhouse I ever saw in my entire life. It had every feature in it, a spa. I felt like it had had a spa, a movie theater, everything in this kind of small space. How does that pride of home ownership, like I’m wondering, Austin how old are you, now? Tom Karadza: You’re 23, I wonder how that, does that get transferred over to, not that, I was going to say our kids, you’re not a kid anymore, but does that get transferred over to the next generation? Austin, what do you think? Tom Karadza: That was your first one at 21? Tom Karadza: That’s a rental property? Tom Karadza: Good for you. Okay, but go on, so you had that feeling. Tom Karadza: Right into the mic, Austin. Austin Furtado: Sorry about that. Growing up I always wanted those stories to be mine. Right? I always tried to work as hard as I possibly could to have similar stories, and seeing the characters, the character development that, that had an effect on my dad, I tried to have the exact same thing, so every time I found an opportunity to work hard, and kind of look back, and see what the lesson was on that, there was pride in that. It didn’t matter what type of job, or if it was a house, or if it was a small job, big job, you know what? I can take a step back and you know what, be proud of what I did, and that was something that I learned from at him at the very, very beginning. Nick Karadza: Boom. How’s that for an answer for you? Tom Karadza: Yeah. Very cool. Austin Furtado: Oh, every time. I love you. Tom Karadza: The power of that one property at the age of 21. Nick Karadza: When I bought that first property when I was 21, I thought-disaster. I own this piece of crap, how quickly can I sell it to someone else? Tom Karadza: Austin, bought something a lot nicer. Nick Karadza: Yeah. A different type of property. Tom Karadza: That need reno-ed. Austin Furtado: No. At the same time, I look at the experiences that I’ve learned from you guys, as well, as buying and holding, I bought that house two years ago, and obviously it’s appreciated, and if I did have those similar stories I would have been like, “Hey, let me cash out now.” You know what? At the age of 22 I would have this money that I wouldn’t be able to have before, but looking at it long-term it’s one of those things that I’ve decided that I’m going to keep this for the next 10, 15 years. Tom Karadza: We’ve all done that. Tom Karadza: Okay. Then you sold that one that you liked? That was your dream house, Ruben, then why did you sell it? Because you could see an opportunity? Tom Karadza: Just listing it higher brought the whole neighborhood up. Ruben Furtado: Exactly. The market was doing pretty well, so all of a sudden I’m like, “Okay. I’m going to sell it.” For the same price that I netted out, I was able, now, to buy something better, and bigger from the builder, because there was a gap, the builder price was actually less than what the resell price was. That’s not the case now. Right? But back then it was. I kept on doing that a couple of times throughout the process. Tom Karadza: Ruben was the first one, Nick I don’t know if you remember me saying, yeah, because we flipped a house together, too, that whole arbitrage thing. Tom Karadza: I have no recollection of it. Yeah. Nick and I have talked about this before on this podcast, we both do things without thinking a lot. Tom Karadza: Just going and doing it and figuring it out. You probably saw an opportunity, some saw that you needed the money. Ruben Furtado: That’s probably what it was. Tom Karadza: Hey, Tom, do you want to flip this property? Otherwise, I’m going to flip it by myself. Best story, ever, though. Ruben Furtado: Hey, I all ready know where you’re going. Ruben Furtado: It was because it was a bungalow loft, so it looked huge. Tom Karadza: Okay. That’s right. It looked huge. Ruben Furtado: The basement, yeah, was just under 3,000. Tom Karadza: Yeah. It was like this huge bunga-loft, thing in Oakville. Tom Karadza: And power of sale, and we could pick it up for like 920,000. Tom Karadza: Ruben’s like, “Hey, this is a good opportunity, do you want to flip it together?” I’m like, “Absolutely,” because talking to you, I didn’t know at the time, you knew the higher end market much better than I did, and you were like, “We could probably sell this thing for over a million pretty easy with just some changes.” Then you called me back 30 minutes later, I’ll never forget the phone call. Tom Karadza: I vaguely remember this. Nick Karadza: Yeah. I know that you’ve thought that about multiple houses. Tom Karadza: You convince yourself. Tom Karadza: I think it was 1.25 or something. Tom Karadza: It listed for 1.3. Tom Karadza: Every real estate agent that you brought in, all the top agents, they all said you were insane that they would never list it for more than 1.15. I remember one agent saying 1.15, and that’s the max. You listed it for 1.3, sold it for 1.25. I remember, because I was there. Nick Karadza: Because you listed it. Tom Karadza: Yeah, which I’ve only done three listings in my life, and that was it. I hate listing, we own a brokerage, we don’t do brokerage stuff. I went to the brokerage I was in with the paperwork not even knowing, I think that might have been either a … brokerage, or an all of Oakville. The first property sold over a million dollars at that time, because they freaked out, I’m like, “Hey, guys. I got my first sale, it’s 1.25,” and their faces just dropped. Ruben Furtado: That was huge. Tom Karadza: Yeah, at that time. But the point was, what you’ve been really good at, as you’ve turned over homes over the years is you sold them for higher than anyone thought possible. In this case, about $100,000.00 higher than even some of the top listing agents in the area thought possible. You listed it for a 150 higher, and sold it, you didn’t just list it, you sold it. I’ve seen you do that time and time again. What is it about a property that convinces you, you can sell it for much higher than other people can sell it for? Ruben Furtado: I get asked that a lot. Tom Karadza: Because I’ve seen you do that 10 times or more. Tom Karadza: Austin, I know you’ve lived in some of these homes. Ruben Furtado: Originally, I used to answer it much differently, and I’ll start off by how I used to answer it, and then I’ll say, really this is kind of the bigger picture, and probably even what’s more important. How we’ve been able to always set a new precedent is by differentiating the home. The houses that we did buy, whether it was differentiating it by doing something in the basement, or whether it was the way we were furnishing it, it was along those lines. Ruben Furtado: Then when we were building, it gave us a lot more creativity in what we can do, and what we can build. But I also think it wasn’t about the differentiating, it was about creating urgency. If we can create urgency, then all of a sudden, and that way if somebody sees something they’re going to take action. That differentiating was really to create urgency. That house that you’re talking about, that was the only house that, like it was similar in size in that area, that had a three car garage. It was very different, and very unique. Right? Tom Karadza: Did that one have three car garage? Ruben Furtado: It did. It was a massive garage. Tom Karadza: Yeah. That’s right. Ruben Furtado: A double tandem. Tom Karadza: They were associating the value of the property with what was spent, instead of the value of the property, and what it could become. Ruben Furtado: Correct. Because what I bought it for, and what I spent on it, and then how do I justify the dealt in the price, and it was funny because I wasn’t even, I’m not the guy trying to sell the house, but I’m telling everybody, “Hey, if I inherent an exotic car from my dad, like a collector’s, it doesn’t matter what I got it for. It’s what’s it worth in the market?” I was showing them other properties in the market that easily, again, these were other houses that hadn’t sold, but were listed around the 1.5, I said, “If they’re listed at 1.5, and what we have to offer at 1.3 it seems like a pretty good deal.” Obviously, it ended up selling at 1.25. Tom Karadza: Did you pick up the idea of making your homes lifestyle homes during that time? Because remember that one home, that custom build you did on that court, that you sold with the Miami pool, and the basement, like the best basement that I’ve ever seen in my life, and I think some high level bank executive bought it, or something. That was another one you set a huge price, but I think you convince yourselves that if you made homes lifestyle homes that you would just get a premium. Is that when that kicked in? Tom Karadza: Into the home. Ruben Furtado: What we looked at is features that would be in a house, that would be two million plus, three million. Tom Karadza: Speak into the mic. Tom Karadza: No. The mics fine, you’re just moving around. Tom Karadza: Not in the whole area. Nick Karadza: The gyms. Spa. Tom Karadza: Your pools were those Miami style pools. I know you remember that house. Austin Furtado: Of course, I did. Tom Karadza: A Miami feel to it. Ruben Furtado: It was very early on, now, you started seeing more people, because what would happen is every time we did a project, whether it be a backyard, and a pool, all of a sudden that was plastered on now the pool company, and everybody would see that, and be like, “Oh, I want that for my next pool.” We were one of the first to actually do that. Yeah. That house, just to give you an idea of the scale of it, my neighbor, at the time, literally, within a short period, like it wasn’t a month or so, his house was the same size, he ended up selling it I think it was like 635. We ended up selling a million 44, like literally not twice as much, but it was exact, and he spent almost as much as we did on our house with all the upgrades. It was huge. Tom Karadza: It just had different features. Ruben Furtado: It was just a huge dealt in price. Nick Karadza: He wasn’t your friend after that? Tom Karadza: Oh, man. But you took that same idea to townhouses, because then when you were buying and selling some townhouses, you would do stone featured walls, but also a steam shower in there. Tom Karadza: What’s interesting about you, watching you turnover, and flip different houses, you were never scared to spend the money. I don’t know what the family dynamic was, and I’m sure Austin has some details between just you and Lori coming to decisions, because you guys spent a lot of money on these flips, but compared to other people who flip properties they were always looking to spend the bare minimum. You know how you always get called to help people flip properties? Tom Karadza: Half the time are you just convincing people to spend more money? Tom Karadza: Because they just want to spend the least and make the most, where you were willing to spend the most, and then really ramp up the price. Ruben Furtado: I think the reason why I didn’t early on, the reason why I didn’t mind spending the money, I was thinking it was like basically getting a family pass to Disney. Let’s say it was going to cost $10,000.00, but it’s like a lifetime pass, and I’m buying it. Then after, I get to use it for three years, and then I get to sell it for $20,000.00 to somebody else, but I benefited from it, so I didn’t mind spending that money, because I knew I was going to enjoy the home, because it was our house, and the intent was to be there much longer, so that was why I originally started spending money. Ruben Furtado: Later on, as it started becoming working for clients, and figuring out what we needed to do in spending money, or whether it be a spec home, then at that point spending the money wasn’t about what I was going to get out of it, it was really on the investment side. The way that I would evaluate that decision would be, if I do this, whatever it was, am I going to sell it for faster or more money. It wasn’t always about more money, because if I sell it faster, it’s an insurance. Right? Those would be the two things, and I remember one time I was building a house, and my budget was 1.1 million, and because of asking myself that question, every single day on every single thing I went from spending 1.1 million on construction to 2.2 million in construction. Tom Karadza: Talk about over budget. Tom Karadza: Austin, your friend always wanted to come to your houses? Tom Karadza: Remember the secret passageway in that house? Austin Furtado: That went straight to my room. Tom Karadza: You need to have a secret passageway. Tom Karadza: On of the theater panels opened up. Nick Karadza: Which was like a legitimate theater, too. It was like a multilevel. Tom Karadza: Oh, gosh. Like three levels. Remember the doors? Tom Karadza: It was a tinted rounded glass. Nick Karadza: That was crazy. Tom Karadza: 250 screen LCD TV, sideways. Tom Karadza: And the movie posters would be on those screens. Tom Karadza: Yeah. Like, and you’re a million over budget. Nick Karadza: Yeah. Exactly, that, and even the thought of it to do that one, and again, that was another one you were building for your family home, and actually you stayed in there for a while, too, until the change, but I mean, for your initial build you decided to do something completely off the wall. That was the first home you did as a custom built for yourself. Tom Karadza: Yeah. It was. Nick Karadza: Generic, so that it should be an easier process? Tom Karadza: I remember you talking about that. Ruben Furtado: And I realized after building a house, I don’t want to build a house for anybody. Ruben Furtado: But I think what kept me going through all of it, and you and I, Tom and I had this conversation where I could literally as I’m describing it, before I even knew it was even built, like as I was describing it, I could visualize that house as if it were standing right in front of me. I could see it so clearly. I think by seeing it so clearly is what made it so real, that it kept on giving me that strength and encouragement to actually do it. Then it wasn’t just being naïve about it, every single, almost daily, I was looking at stacks. Right? I was looking, okay, what’s selling? Right? Ruben Furtado: Obviously that’s not a question that somebody’s prepared to answer, and nor did I expect her to answer. But, I said there was basically 11 houses. Of those 11 houses, how many were modern? I said, “Six.” I said, “Why weren’t there more modern sales?” It’s because there wasn’t any other inventory. I knew the stats right to what was actually moving, and that was the belief as well as doing the due diligence, knowing that, hey, we have something that is actually lining up with what the market wants. Right? It was a matter of time to go through the process and make it happen. Tom Karadza: You knew the stats better than you thought anyone knew the stats? Ruben Furtado: Oh, for sure. Tom Karadza: Because you were thinking six out of 11 in all the GTA, because the percentage, that’s over half of the percentage of over six million, but if you take a contemporary or modern home as a percentage of the entire market, what’s the percentage? Nick Karadza: I remember taking to you all these numbers, you had an idea of those numbers. Ruben Furtado: At the time I did. Nick Karadza: You knew. Yeah. Ruben Furtado: Yeah. Again, this is going back to 2012. This was six years ago. The one thing I remember very vividly it was like basically the 11th sale, and of the 11 six were modern, and when modern wasn’t even a thing. Right? Tom Karadza: It’s funny how things work, because all of this adventure through you, with your family, doing all this stuff, you were going to be a builder, that was the plan. Tom Karadza: Do a lot of contemporary stuff. I know here at Rockstar the phone will ring, and people will not even know you saying, “Can I specifically speak to Ruben Furtado, because I’m going to flip a house.” Then we say, “Absolutely not,” and we hang up the phone on them. But you’ve crafted out a niche for yourself, now. I know you’re feeling it. Tom Karadza: That’s primarily who you’re working with now, because you’re not building, but you’re helping people. You’re basically advising now, unintentionally, almost. No? Ruben Furtado: Yeah. We’re leveraging that success that we had on a lot of our own personal homes. Particularly on that one, and I’ll refer to it as Belvedere, because that was the street that it was on, because that house ended up going viral on the internet. Tom Karadza: Front page of the Global and Mail? Tom Karadza: I’ve seen people take that house and claim it as their own. Austin Furtado: It’s a thing. Tom Karadza: Yeah. As Ruben being your dad, does that bug you when you see people doing that? Austin Furtado: No, because we’re right behind them, oh, that’s our old house. Right? Tom Karadza: Yeah. Got it. Tom Karadza: Okay. When they post it, you guys are cheering it on. Yeah. Tom Karadza: That was our place. Austin Furtado: Yeah. It was definitely a cool house to live in. Tom Karadza: You’ve seen that, though, right? Nick Karadza: Yeah. Me, too. Tom Karadza: You’re helping people now. Tom Karadza: Now, it’s you are working with, so this is how it’s come, because Austin is now, you guys are working together? Tom Karadza: Now, you’re branding yourselves as the Furtado Group, correct? Tom Karadza: What are people doing, I know you’re helping people do flips, and builds, and the whole bit, what are the things? What’s going on right now in that market? Are people buying big lots, small lots, modern homes, what are the trends? Ruben Furtado: It depends. We work with two different type of people. We’re working with people who are still wanting to build their dream home. Right? But, they want to be smart about it, buying the right lot, building the right house. From an investment, it’s a wise investment, but it’s still the primary. Then we work with other people who are strictly building on spec with the intentions of selling. It varies who we are working with, and what their goals are. Right? Ruben Furtado: I feel that everybody still has this mentality that in order to do well and build these luxury homes is that they have to build these massive houses. They try to buy these big lots, and build these massive houses. Where we’ve been experimenting a little bit, and we’ve been finding that, what a minute, the cost of land is too expensive, the cost of construction is too expensive, so what if we make them more efficient, smaller house, but still give it the same kind of wow factor, and lifestyle that you would in these multimillion dollar homes. Right? Ruben Furtado: We’re seeing a huge market for that. Right? That is one of the things that everybody that we’re working with, whether their building on spec, or whether they’re building a dream home, is to kind of draw them back in, I tell them, “Hey, if you think you need 4,500 square feet, let’s just start off with 38, because eventually as you start building, and start doing your planning it’s probably going to go to 4,000,” but if they start it off with 3500 square feet it quickly ends up at over 5,000. Tom Karadza: On the resell. Ruben Furtado: I will actually, really, really encourage, “No. Let’s get the best lot, and we’ll sacrifice a little bit on the build,” whether it be size, or some of the fit and finish, but the location is going to be key. The nice thing is getting in early. Then the other thing is, is once they start building it’s now, you know, everybody when they start building, their first expectations are like, “Okay, this house, I’m going to build it, it’s going to be worth X,” and because they’re building for themselves they don’t want to spend their money, “Oh, I don’t need heated floors in the washrooms,” well guess what? Ruben Furtado: Now, when they want to sell it, now they get really greedy, and they want three million dollars, but yet they don’t have heated floors, or they don’t have certain features that you would expect in a three million dollar home. Right? I think that cycle changes, and if people can go back to the beginning, and say, “Hey, I want to know what my exit strategy is going to be when I sell that house,” they would be doing a lot of things a lot differently when it comes to the features that their implementing in it. Tom Karadza: With Austin doing some of your social media stuff, now, you know you’ve basically bread a marketer. Tom Karadza: Do you pay him anything? Ruben Furtado: I do and I don’t. Tom Karadza: Is it family slave labor for Austin? Tom Karadza: If you’re listening to this, and you want to check out some of the properties they deal with, you have to check out the Instagram account. What is the Instagram account? Austin Furtado: It’s at the Furtado Group. Right. It’s our handle for pretty much everything. If you’re looking on YouTube, Instagram, Facebook, we’re all on there. Tom Karadza: You got to check out these properties that they’re doing. One other thing, though, just on that note, if you ever go on a trip anywhere with Ruben, Austin, I don’t know if you know this, but if you go on a trip with Ruben, like we did, we went to the see the UFC, the Georges St. Pierre fight in New York, we went for a few days, you become Ruben’s personal photographer. Austin Furtado: Oh, a 100%. Tom Karadza: Yeah. Okay. All right. Just so that we’re all on the same page. Austin Furtado: Content is key. Tom Karadza: Yeah. Oakville still your prime location? Then what percentage of people that you work with do you flip versus buying for themselves right now? I’m curious. I haven’t asked you that in a long time. Ruben Furtado: Yeah. You know what? We also work with people who are just buying their primary, and selling their primary. When we look at people who are actually doing a custom build, I would say that it’s probably like a 60/40 ratio. 60% are doing it on spec, 40% are doing it for themselves. Tom Karadza: Today’s latest features, you know how before it was like the spa that wasn’t there, and the movie theater, what is it? What are the things today? You know how you say you jam, like in a smaller house you can jam all the things in it, like I know the biggest thing for you is technology, because one of your houses we went to we couldn’t get in the front door, because the software was updated. Tom Karadza: We were having a Christmas party at your house, and nobody could get in the house. Do you remember that? Ruben Furtado: What did we use a shoe? Tom Karadza: Yeah. It was a multimillion dollar home with a front door that wouldn’t work. Yeah. Is it automation? Tom Karadza: Yeah. I know. What is it? I don’t think the movie theater is it anymore. Tom Karadza: Not like a gym, it’s more like a yoga studio. Tom Karadza: You’re upgrading the quality of the entire house? Ruben Furtado: It’s really just giving it a look that you wouldn’t typically see in your traditional builder homes. Nick Karadza: Something a little bit trendy, something that’s a little bit different. Nick Karadza: Because of that, and this is what they’re looking for. They’re looking for the money shot. Tom Karadza: Yeah. Well, you’re old. Tom Karadza: You’ve naturally always had a good design sense about you. Who are the buyers for the three million, you know, if someone is spending money on a three million dollar home, whose buying it? Ruben Furtado: Sometimes it’s going to be a foreign buyer that’s coming in, basically opened up shop, like a business here, and is buying that for themselves, but a lot of times it’s going to be professional, like whether it be a doctor, a lot of the folks are working in the medical field. Right? Yeah. There’s no stereotype. There really isn’t, because I’ve seen, like on a modern house that you would think would be more of a younger professional and it was a 72 year old man wanting to buy a five million dollar modern house. Right? Like I said, there isn’t really a stereotype. Tom Karadza: And it’s kind of the lower price points, but the headlines right now, I think, are going to be great for everyone over the next few months, and I mean great by funny, because they’re going to be negative, because of all the price increases were so great last year, if we don’t have the same price increases this year, it’s going to look bad on the year over year comparisons. Are you seeing, is it still active at that price point? Ruben Furtado: Let’s say it’s a piece of land for a million dollars. Right? That land, if you’re going to build, you’re probably going to spend somewhere around a million building it. It’s not like it’s a crazy deal, and then you’re seeing, like even another piece of land set a new precedent, like in southwest Oakville, just south of Lake Shore, we saw something sell for over two million. That was unheard of. Right? Yeah. I don’t really see that the price of the house having a huge impact, and on the type of activity, I just think the right house, priced well, is still moving. Right? But, is there are fewer sales? Absolutely there is. Have the prices come down? Yeah, on the houses that were either flawed, in the wrong areas, over priced, yes, the prices have come down, but anything decent, like we have a bunch of listings that are coming out, and I’m extremely confident. Right? Nick Karadza: What have you seen people where it’s just been like, man, they really missed the mark on this type of thing? Tom Karadza: Instead of knocking it down? Tom Karadza: Then doing an addition. Nick Karadza: And you’re limiting yourself to what was there. Tom Karadza: They bought one street over, so it was too cheap, so if the market changes a little bit they can’t the premium. Nick Karadza: Yeah. It almost came out there. Ruben Furtado: Right? But, a good decent builder with a higher quality home, if you’re building what they’re building, you’re building too cheap for a custom home. You have to be above and beyond that. Right? If the standard is nine foot ceilings, in a builder home you have to be 10, when you’re doing custom. Same thing, second floor, nine foot ceilings. Basement, nine foot ceilings. All right? In addition to that, would be is where they’re cutting back. When I see somebody trying to sell like a three million dollar home, and they literally, the house has nothing that differentiates that house from any other house, that would be the other thing that’s going to make it really difficult. Tom Karadza: The differentiator could be what, like a waterfall, just little features? Ruben Furtado: Yeah. Little features. Tom Karadza: I’m trying to think like glass walls. Ruben Furtado: That, but it’s even something as simple as a lot of these houses that you see, and you see them all the time on MLS, they’re asking 2.2 to three million dollars, and the house is not even staged. Tom Karadza: Little bit to, yeah, to put that loft out there. Tom Karadza: Yeah. It’s no different than a closet with a window. Tom Karadza: Capped out, I need to pay everything back, just sell this house for me. Ruben Furtado: I’ll tell you there’s story after story where people bailed, and then literally an investor will call me, we’ll pick up that property, and we will then finish it off and do it right, and there’s money to be made. Tom Karadza: It’s funny, you know how we talk, Nick, you know how we always talk in business that you never want to be compared in business to any other business otherwise you’re reduced to a commodity? Tom Karadza: You know, like in business if someone could compare with what you do as a business, to the business across the street, the only comparison that they can use is price. You’ve turned yourself into a commodity, and it’s what I’m hearing you say, because if you build a house that kind of looks like a builder house, the kitchen kind of looks like a builder house, the feature’s kind of look like builder finishes, even if it’s a custom kind of, like a higher end builder, you’re then reducing yourself to being compared to those guys, whereas, what I hear you saying is if you make it unique where they can’t compare it, so that I know a lot of the houses that you’ve done in the past instead of it might only have a two car garage from the outside, but you’ll put a lift in it, and now, all of a sudden it’s a three car garage. Tom Karadza: Now, when your kind of searching you can’t find a house that can store three cars, so now I can’t compare, or it has three cars, and it has like a nanny suite in the house, so now if there’s another house that’s same square footage maybe only 3,000, not only 3,000, my gosh, 3,000 square feet, but it has a nanny suite where other 3,000 square foot houses near don’t have a separate entrance, nanny suite, it’s totally different. Right? You are just making the product unique from the beginning, and it gives you the premium price at the end. Austin Furtado: A 100%, but when you mention the lift in the garage, to go from a two car to a three car garage, you start looking at stats, and you start saying, “Okay. How many houses over two million have a three car garage versus how many have a two car garage?” You start limiting your competition, but it’s not just having the lift, you got to make that garage look like a three million dollar house. Tom Karadza: You’re staging the garage. Austin Furtado: We’re staging the garage. Tom Karadza: Awesome. That’s great social media footage. Tom Karadza: Do you remember when we raced cars in Vegas, and you were the slowest? Nick Karadza: Did you see everyone’s face change? Ruben Furtado: Denial. Right away. Tom Karadza: Of course it’s big. Ruben Furtado: Looks like it’s going slow. Tom Karadza: …and they all said it was the fastest car, you wanted to get… It was funny because we were taking a video of you coming around the corner, we’re like, “Oh, we’ll take a video of Ruben,” and you were going so slow, that everyone was just like…we were all there for your dads birthday, and Mike was video tapping it. Tom Karadza: Not video tapping, he had his phone out videoing it, and he just lowered his arms after like 10 seconds, like, oh, my God, this is so slow. Ruben Furtado: The car was going fast. Tom Karadza: No. You weren’t going fast at all. You were going the slowest. Nick Karadza: Anyway, it’s a good point, about the lift, especially because the lift, an empty garage with a lift looks like a mechanic shop. Nick Karadza: They’re like a five year old person, and you’re giving them the entire picture. Tom Karadza: I’m sure even the pictures you guys do are just over the top. Tom Karadza: Do you remember, by the way, just on this whole car thing, do you remember when we were working together at Oracle, and when we’d go for lunch, I was driving my Honda Civic, and you wouldn’t get in it, because you wouldn’t be seen in a Honda Civic. Do you remember that? Tom Karadza: My four door Honda Civic stick was still the best car ever. I bought that thing off lease drove it for a year, and then sold it for higher than the buyout, the Honda Civic was the best. Ruben Furtado: Was it black? Tom Karadza: It was black. Tom Karadza: Cloth interior. It was perfect. Four door. Manual windows. Nick Karadza: You’ve never been a car guy, though. Ruben Furtado: I don’t care about cares. Tom Karadza: It was $80.00 for a tire replacement, I remember a tire, I popped a tire, and I needed to get a new tire it was $80.00. On the X5 right now, you pop a tire, the bill came to me, because I ran a flat tire, they were like, “Yeah, we put on the new tire,” and I forget what else they did, it was like $650.00. What? Anyway. Ruben Furtado: But, when you were talking about pictures, every year, depending on the board you’re putting it on, let’s say it’s going in the Toronto board, you’re allowed 20 pictures. When I see somebody’s listing a three million dollar home, or a two million dollar, even 1.5 million dollar home, and they’ll use like a picture of a powder room, I’m looking at a free standing sink and a toilet, if that picture doesn’t scream 2.5 million, it shouldn’t be on a listing. Tom Karadza: Why did he not see the house? Ruben Furtado: He was working overseas, he actually, his wife was here, she came in. Ruben Furtado: He saw it overseas, and again, it’s all about creating urgency, so we have a whole process of the day and the hour that a listing gets out there, because we know the trends, and when people are looking, so it literally got out to the buyer, the buyer immediately called the wife, the wife ends up going to the house, and boom, we have an offer. I think it was that day, or the very next day, because they were trying to jump ahead of the open house. Right? Because we were having an open house on Sunday, but back to that point, he hadn’t seen the house, and he actually bought it at 2.7 million dollar house without seeing it. Tom Karadza: Thanks for helping out your dad, your dad is busy. I look at Austin, and you shouldn’t be jealous of someone but I see Ruben with Austin, I’m like, how he has his own marketing guy walking around with him, and it’s his son. Tom Karadza: You can’t get greater than that. Austin Furtado: Vice versa, too. You know what? Growing up, knowing what you want to do, and know when you grow up, not everyone can say they have a really good mentor in their family or in their house, so as much as he’s lucky that we kind of work off each other, having a mentor in the field that I wanted to be in and being able to work with him on the team, has been awesome as well. Tom Karadza: Do you deserve this son? Nick Karadza: Don’t get teary. No. No. Tom Karadza: He said that. Ruben Furtado: I created him. Tom Karadza: Yeah. Yeah. Yeah. Austin Furtado: He gave me life. Tom Karadza: Very cool. Yeah. Very cool. All right. Cool. Thanks guys. We’ll do this again. Tom Karadza: Hey everyone, it’s Tom Karadza, so thanks for listening to that episode. We had a fun time chatting, we’ll have those guys back on, for sure, at some point. There’s a lot more to chat about. Some of the next episodes are already planned and booked, so they’ll be coming your way shortly. Remember the email to use if you have any show ideas, interview guests, whatever, it’s podcast@rockstarinnercircle.com. Podcast@rockstarinnercircle.com. That’s also the website to check out more about us, it’s www.rockstarinnercircle.com. We will talk to you soon.